Z-Communications, Inc. announces a new Fixed Frequency Synthesizer model SFS0990C-LF. The SFS0990C-LF is a preprogrammed synthesizer that is phase locked at 990 MHz to an external 10 MHz reference oscillator. 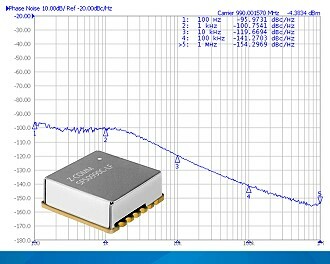 This PLL features an exceptionally low typical phase noise of -119 dBc/Hz at 10 kHz, -100 dBc/Hz at 1 kHz, and -141 dBc/Hz at 100 kHz offsets. The RoHS compliant SFS0990C-LF is designed to deliver a typical output power of +1 dBm while operating off a VCO voltage supply of 5 Vdc and drawing 25 mA (typical) and a phase locked loop voltage of 3 Vdc while drawing 14 mA (typical). This Fixed Frequency Synthesizer features a typical 2nd harmonic suppression of -12 dBc and spurious suppression of -70 dBc. It is housed in Z-COMM's standard PLL-V12C package measuring 0.6 in. x 0.6 in. x 0.22 in. The SFS0990C-LF is also ideal for automated surface mount assembly and is available in tape and reel packaging. SFS0990C-LF is an excellent choice for basestations, mobile radios, and satellite communication applications which require quick and simple integration while demanding high performance over the industrial temperature range of -30 to 85°C. For further information on this model or any other product from Z-Communications, Inc. please contact our Applications department via e-mail at applications@zcomm.com or call us at 858-621-2700. Z-Communications Inc. has been leading the wireless world in Voltage-Controlled Oscillator (VCO) and Phase-Locked Loop (PLL) technology for over two decades. We are the largest manufacturer of VCO and PLL modules for the commercial/wireless market. To ensure our dominance as the leading RF/Microwave component supplier, Z-Communications, Inc. invests in continuous research and development to develop state of the art RF/Microwave components. We hold patents in ultra low noise technology, which enable us to provide excellent performance.